It’s time for another traktip! A long time ago, our customers asked for a way to prefill an issue so that end users wouldn’t need to input as much information. We responded with Quick Picks, a drop-down menu option that allows users to choose an issue submission template that pre-defines certain information for them. We also introduced the Prefill Form: a screen that, when enabled, would appear to end users before the issue itself, prompting them to select either “Issue Type” or a “Quick Pick.” By choosing one or the other, they could load up an issue submission template with some information pre-filled for them. However, choosing between “Issue Type” and “Quick Pick” could get confusing for end users who didn’t know which was the preferred option. For organizations that wanted their end users to exclusively use either Quick Picks or Issue Types to fill in information, having users mistakenly choose a different option caused headaches behind the scenes as staff needed to rewrite and re-categorize the mislabeled issues. Introducing the Pre-Submit Screen. Much like the Prefill Form before it, the Pre-Submit Screen shows users a simpler initial screen when submitting an issue. It achieves this by allowing admins to decide whether they want end users to only see a Quick Pick drop down menu or an Issue Type drop down menu (or both, if needed). If you do not use the Pre-Submit screen, the default Custom Screen will be used when first opening the Submit Issue Screen. 1. Click the System Settings icon (in the shape of a gear) in the upper right hand corner of your Issuetrak main page. 2. On the left hand menu, choose the “Features” option. 4. Check “Use Pre-Submit Screen” to enable the feature. 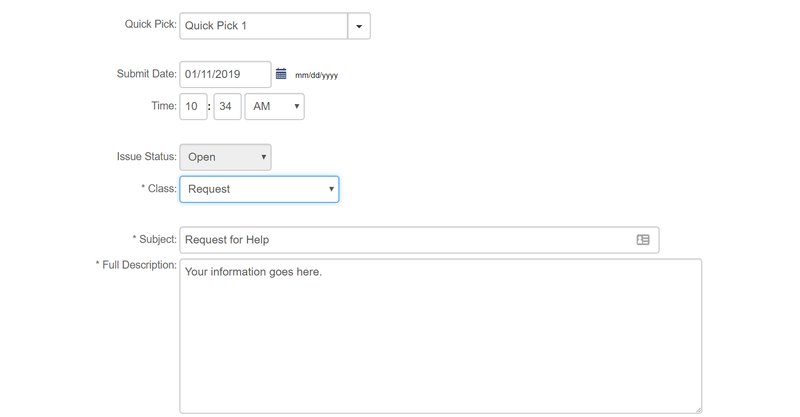 Note that users who do not have the “can view and select from Quick Picks when submitting issues” permission will not be able to submit issues. This permission can be toggled on and off via a user’s User Record or Group memberships. In the case of using Active Directory, User Templates can also be used. The next time a user loads an issue, they should see a screen like this prompting them to choose an option based on which selection field you’ve enabled. The user can then choose an option from the Quick Pick drop-down menu. Selecting an option will bring up a partially pre-filled issue submission form. With that, all of your end users will have an easier time selecting the proper option -- speeding up the issue submission process and saving you plenty of headaches! As always, if you have any questions or would like to see this in action via a quick demo, don’t hesitate to contact your Account Manager. We’re happy to help!